With half the year behind me, it’s about that time for a photo dump! I know that’s what Instagram is for but most of the time I don’t think about sharing pics right away so… here they are now, heh. 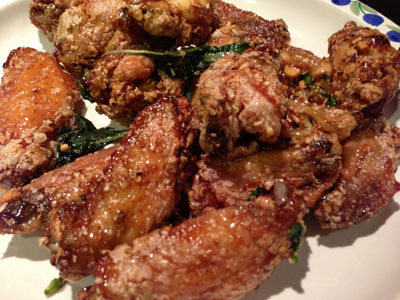 After we went to Portland and had the fish sauce wings at Pok Pok, I asked Rob to try making them one night and he obliged. They don’t look pretty but they were OHSOGOOD. Recipe here. 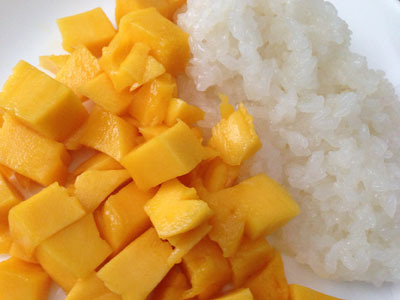 I also made mango sticky rice for dessert a few times — it’s one of my favorite desserts and so easy to make too. Recipe here. I’ve never been a huge burger fan (though I do LOVE Shake Shack) but on a business trip to San Francisco, I got the chance to try Super Duper Burger. YUMMY! At our local mall, a new pizza place opened called Pieology. 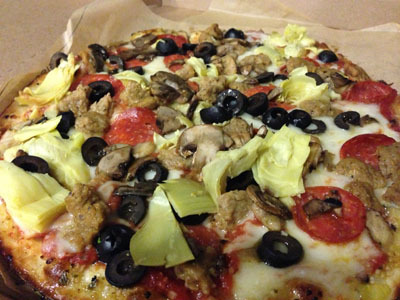 For only $7.50, you get an oversized personal thin crust pizza that you can customize with as many toppings as you like. They also have this amazing herb butter that they spread over the dough before it bakes. WOW. IT’S AWESOME. 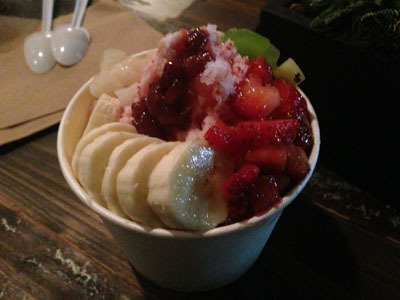 Finally tried the shaved ice/frozen yogurt combo at Milk & Honey. Gawd, I love dessert. So in planning, there were specific food experiences we wanted to have. Like a classic NY bagel. A NY pizza. Street meat. One great table service dinner. And so on. When I traveled to San Francisco for work back in May, I took the opportunity to order room service at my hotel. 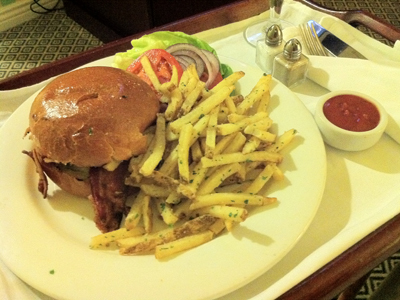 It was a Kobe beef burger and fries from the hotel’s restaurant, Grand Cafe. There’s something about room service that makes me feel so indulgent. 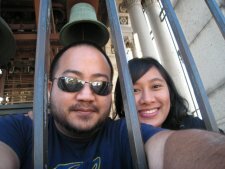 Since BFF’s wedding was up in Santa Monica, Rob & I decided to take a few extra days off from work and stay in the area. 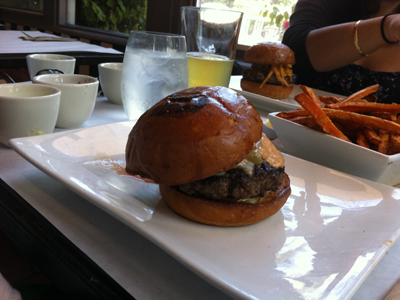 We’ve been wanting to check out Umami Burger (saw a feature about it on the Food Network)… so we did! AND IT WAS SO YUM. 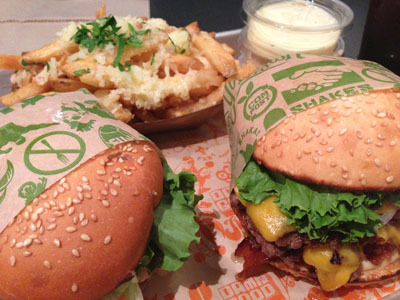 We went with some friends so we got to sample the Umami, Manly, and SoCal burgers. My favorite was the SoCal. It had some sort of spread or dressing that was DELICIOUS. Guh. I want to go baaaack. For brunch, my LA expert (Carms) recommended Huckleberry. 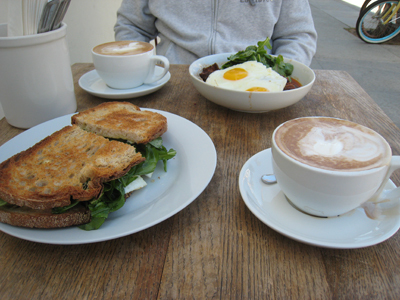 We tried the fried egg sandwich and the Niman Ranch brisket hash. So good! Seriously, I think I need to plan a staycation/foodie weekend in LA someday. 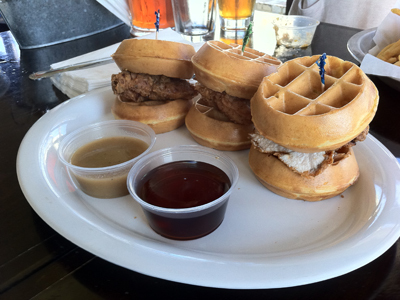 The last foodie-ish thing we did in Santa Monica was go to Happy Hour at a bar (the name of it escapes me) that serves chicken and waffle SLIDERS. Sadly, they were average at best but I’ve never seen them in slider form before so they get points for that I guess. 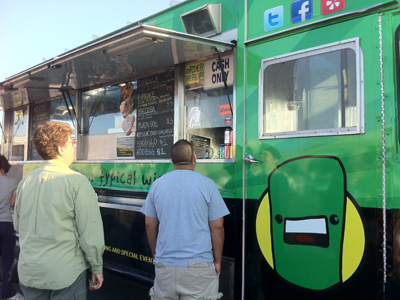 Rob & I are food truck fans. 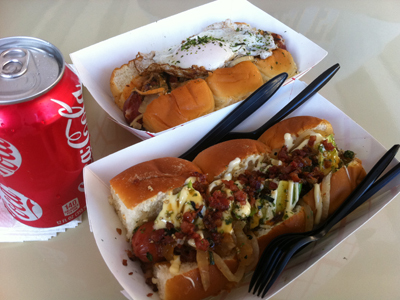 We’re also fans of hot dogs with Japanese toppings like the ones we had at Japadog in Vancouver. So when we heard about Dogzilla, a food truck with similar hot dogs roaming around Orange County, we decided to check it out. 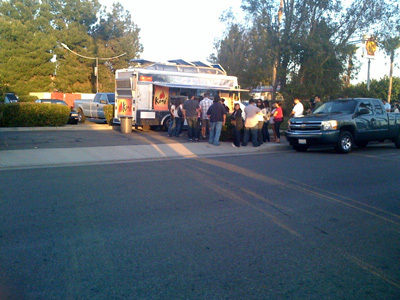 Luckily there was a stop in Irvine a few weeks back and off we went. The BEST part is that it was at an elementary school open house. LOLARIOUS. 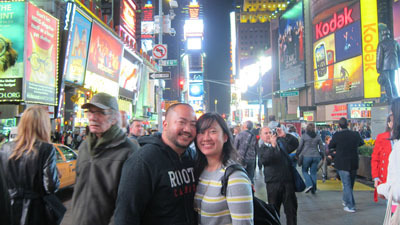 And no, we were not the only people there without kids. Heh. All that said, it was AMAZING. 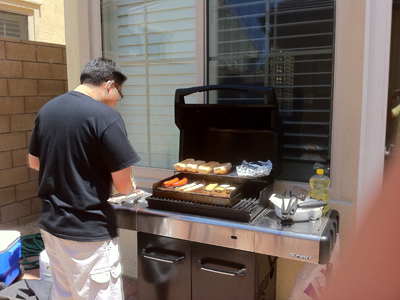 On Memorial Day, we had some friends over for a little barbecue. Hot links and sliders, oh my! 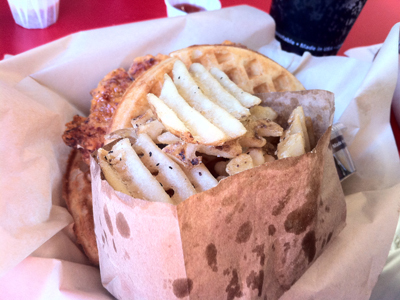 Last week we went to see The Hangover 2 (not as funny as the first) and before the movie we stopped at Bruxie in Old Towne Orange to try their waffle sandwiches. I wanted to save room for movie popcorn so we split a chicken and waffle sandwich (can you tell we really like chicken and waffles?!). SO GOOD. Only bad thing is that they don’t offer gravy. What’s that about? 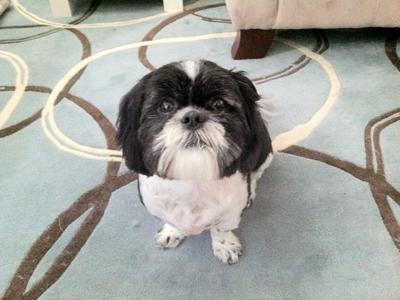 So to temper all these foodie pics, Diesel wants to show you all his haircut. 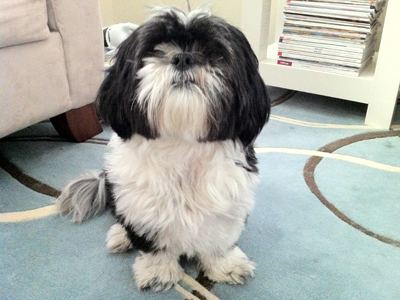 Above is before when he was all shaggy. And here he is after! First up… Happy Birthday Jimmy (aka roomie)! Yesterday Rob and I celebrated Cinco de Mayo by checking out the famous LA Kogi BBQ truck. Seriously, it’s famous — even the NY Times has written about it! 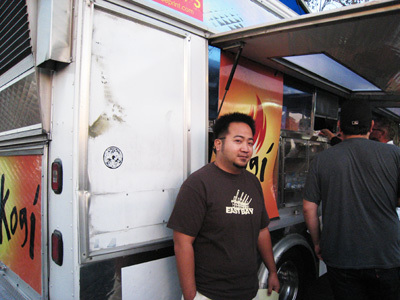 The heart of Kogi are their Korean-style tacos and burritos served with your choice of short ribs, spicy pork, chicken, or even tofu. The meat is covered with shredded cabbage and a chili salsa and cilantro-lime relish. Mmmm. So the trucks are finally making their way down to Orange County and we couldn’t pass up the opportunity to try it out. I found out from their Twitter that one of the trucks was scheduled to be in Fullerton from 7pm – 10pm so armed with the knowledge that the line starts early and gets looooong, we left Irvine at 5:30. !!! We got there at 6:15 and there were 3 people in line. We killed about 20 minutes at the nearby Sports Authority then headed back. In that short amount of time, an actual line had started to form and we were about 20th in line. Not so bad. The truck arrived 10 minutes early and proceeded to park in the back parking lot. Uhhh… at first there was some confusion. Do we turn around? What about our places in line?! 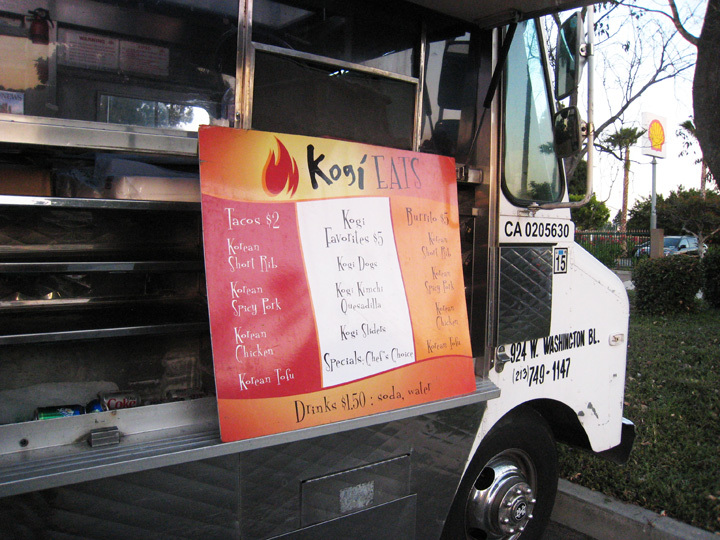 But everyone was feeling the Kogi love — and once we all turned around to walk to the truck, we got right back into the same order we started in. Rob took this pic of me standing in line. You can BARELY see me. I’m wearing a black hoodie. NO, all that food was NOT just for the two of us. Though that would be really funny if it was. We were ordering for 5 and bringing it all to a friend’s place. And finally Rob posing with the Kogi truck. Hee. I AM LAME and totally forgot to take pictures of the food before we devoured it. ARGH. Sorry. 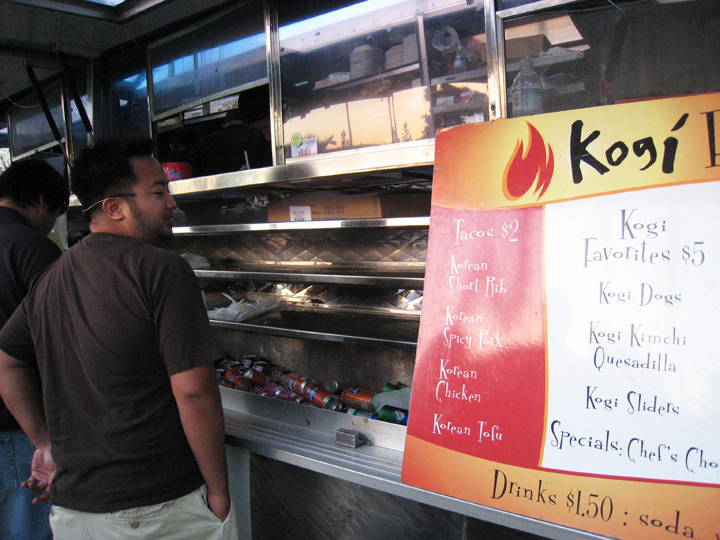 If you’re curious, the yumminess can be seen here on Kogi’s site and here on Yelp. Beware — don’t look at the pics on an empty stomach! For the record, my favorites were the short rib taco and kimchi quesadilla. I had a couple of bites of the short rib burrito (which has scrambled eggs and hash browns in addition to the salsa and relish) and I’m totally getting that next time. YUMMERS. So I haven’t mentioned it here because I was waiting for official confirmation and I got it on Friday… my company is letting me keep my job and work remotely from home! YAY. When I gave notice back in December, I mentioned to my boss that I would be interested in working from home if she was willing to try it out. She sent a recommendation to corporate weeks ago and they finally approved it. 😀 Right in the nick of time since my last day in the office is tomorrow (Tuesday). I’m so relieved I don’t have to look for a job! Phew. Plus, I can wear jeans every day. WOOT. It’s always the little things that make me so happy. 1. Have the BEST RAMEN EVER at Santa Ramen. CHECK! 2. Have 1 really nice (but not necessarily expensive) dinner in San Francisco. CHECK! 3. Have ice cream at Sketch. CHECK! 4. 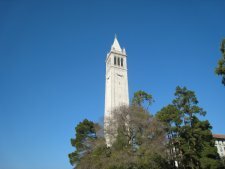 Walk around 4th Street in Berkeley. CHECK! 5. Have the most AMAZING chicken and waffles breakfast at 900 Grayson. CHECK! 6. 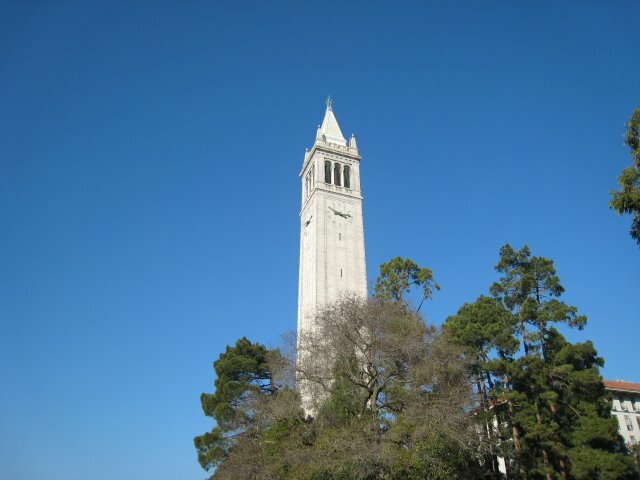 Visit the UC Berkeley campus, look at the view of the Bay from the top of the Campanile, and purchase as much school paraphernalia as possible. CHECK! 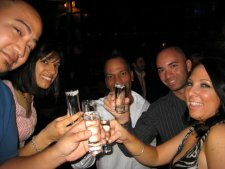 And I have pictures too! Too bad I’m sick. I have a cold. And a runny nose. Not the greatest way to spend my birthday. Oh well. 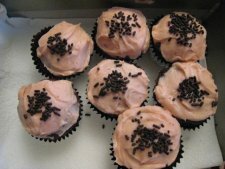 One of my managers made chocolate cupcakes with strawberry frosting for me. They were so yummy. 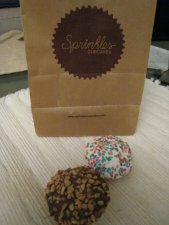 We enjoyed these at work yesterday after an unexpected birthday lunch at One Market Restaurant. Then I got home to find that Rob went to SPRINKLES! in Palo Alto to get my favorite red velvet cupcake along with some other flavors to try. SO YUM YUM YUMMY. Their Red Velvet is the BEST light chocolate cake with the most amazing cream cheese frosting. Black and White (dark chocolate cake with vanilla frosting) is a solid classic, Chocolate Marshmallow is a unique treat (dark chocolate cake with marshmallow cream topped with chocolate ganache), and the Strawberry (strawberry cake with strawberry frosting) just might be a new favorite. MMMM. 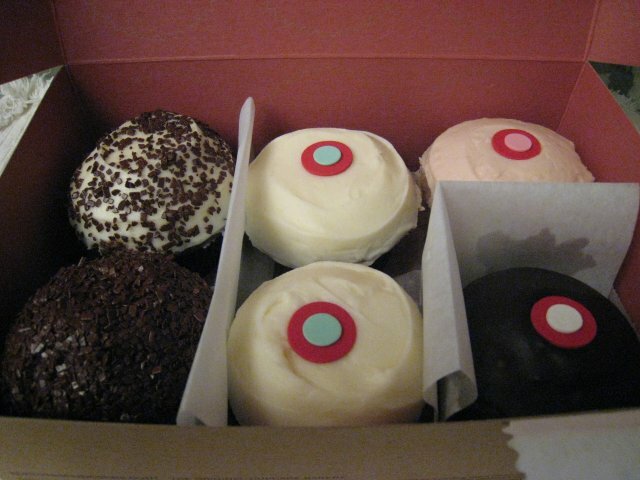 (Don’t worry — Rob and I split these cupcakes. I admit I’m a piggy but I do exercise restraint sometimes). Rob even picked up a couple of doggie cupcakes for Diesel — carob and yogurt flavored. He totally went crazy over these. Rob *also* surprised me with the metallic rose Nintendo DS. 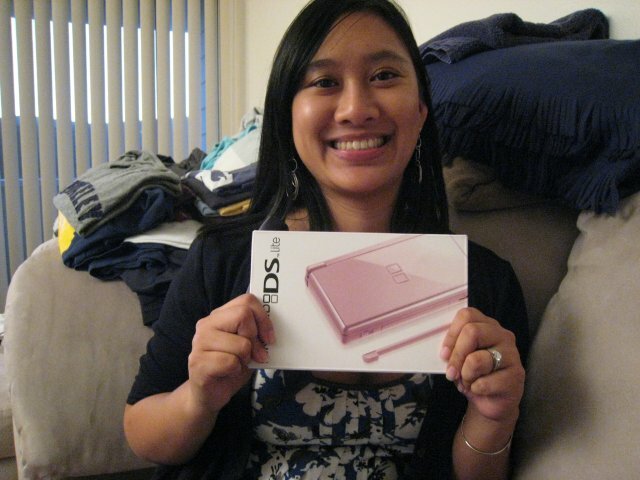 (Please excuse my crazy face and the laundry behind me — how embarassing). The only game I have right now is Mario Kart and it’s THE BEST. Didn’t do anything at all today since I wasn’t feeling up to it but I managed to get myself together to have a low key birthday dinner at Santa Ramen, my favorite Japanese ramen house across the bay. Soup was a good choice for this little sicky. Then we headed to San Carlos and the newest Bay Area Red Mango location. I know it’s a trend but I seriously LOVE LOVE LOVE tart frozen yogurt. 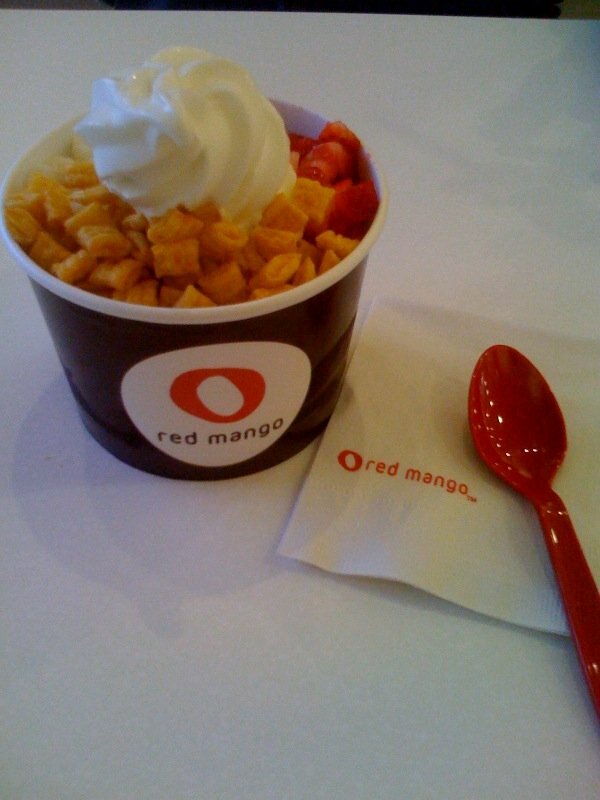 And Red Mango’s yogurt is pretty awesome. It’s nice and creamy with a really subtle tart flavor. I do wish it was slightly more tart than it was (like Pinkberry) but overall, it was excellent. Rob and I got our usual Original flavor yogurt with strawberries, captain crunch, and mochi toppings. Random. I cannot send or receive text messages on my cell phone. UGH. I think it stopped working about 4 weeks ago when I went into the AT&T store and had my SIM card replaced. GREAT. I cannot wait to get on the phone and deal with AT&T on this. They are SO HELPFUL. Umm, NOT. 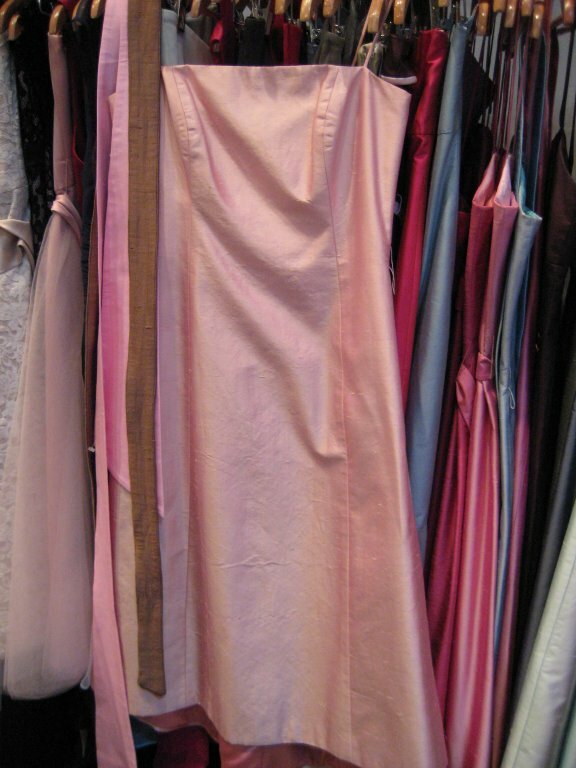 Again I wrote a post that I forgot to publish… oy vey. I am *so* not a Monday person. I just LOATHE waking up knowing the weekend is over and I have to go back to work. UGH. Had a good weekend… on Saturday morning, Rob and I had THE BEST ramen EVER. 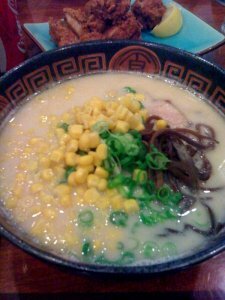 We went over to Santa Ramen in San Mateo. Yes, all the way on the other side of the Bay. It was SO worth it. The portion size was ginormous and I ate every last bit of it. I wish I had pictures to share so you could all see the size of the bowl I consumed. Unfortunately, we were sitting at a cramped 2-person table with 2 other couples sitting on either side of us so I did not feel comfortable whipping out the camera, hehe. Good movie but I got a little bored. :/ And I like Will Smith! One thing I want to mention — it felt like the movie got to the present without really explaining what happened to Robert Neville in the time since the quarantine. I didn’t realize this until just now, though, so it obviously didn’t affect my viewing at the time. Recommended. Cheesy, cheesy, cheesy movie. 😀 But then I’m a HUGE fan of Dwayne Johnson, aka The Rock. (Rob used to watch wrestling religiously — that’s when I discovered the greatness that is The Rock). It was the typical “guy discovers daughter he never knew he had and his whole life changes” story. But I liked it (I think Rob rolled his eyes throughout most of the movie and proceeded to fall asleep at the end) and recommend it. I meant to post this days ago. OOPS. I got back from Las Vegas on Sunday. And I totally sat at work on Monday doing nothing. Shhh. Don’t tell on me. I was TIRED. So my friend (and bridesmaid!) 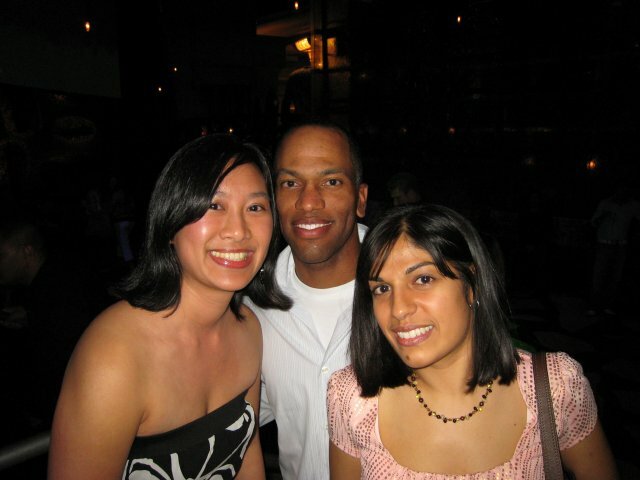 Ruby wanted to surprise her boyfriend Jason (also my good friend and colleague — I used to be his assistant and now he’s my sales rep) with a birthday trip to Vegas with friends. Rob and I arrived on Friday night (after a short delay in Oakland, of course) and after a quick change of clothes, we headed off to the Mandalay Bay to meet up with our friends to surprise the birthday boy. We were supposed to meet outside of the Orchid Lounge, which is where Ruby and Jason were having drinks. 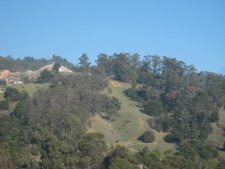 As we approached, Ruby happened to be looking in our direction and what did I do — I WAVED. OMG. I’m such a moron. Luckily, Jason was looking down and didn’t see me. Phew. Once all of us were gathered, we walked in and practically jumped all over the poor guy. 😀 After a few hours of talking and drinking (only half an Amaretto Sour for me), we went over to the Rum Jungle for more drinking (not me) and dancing (yay). We went to Aquanox at the Venetian for dinner. YUM-O. I had the filet mignon at a seafood restaurant. Hee. Afterwards, the guys headed off to the blackjack tables and Ruby and I took advantage of the free drink service (just cokes for me). Aaannnd that was our weekend. We hopped on a flight back to Oakland early on Sunday morning and took a nap as soon as we got home. In fandom news, has anyone heard/read the casting news for Prison Break season 4? WHAT THE HELL. TV Guide’s Ausiello has an interview with the executive producer if you want to read all about it. I think I might start watching again. 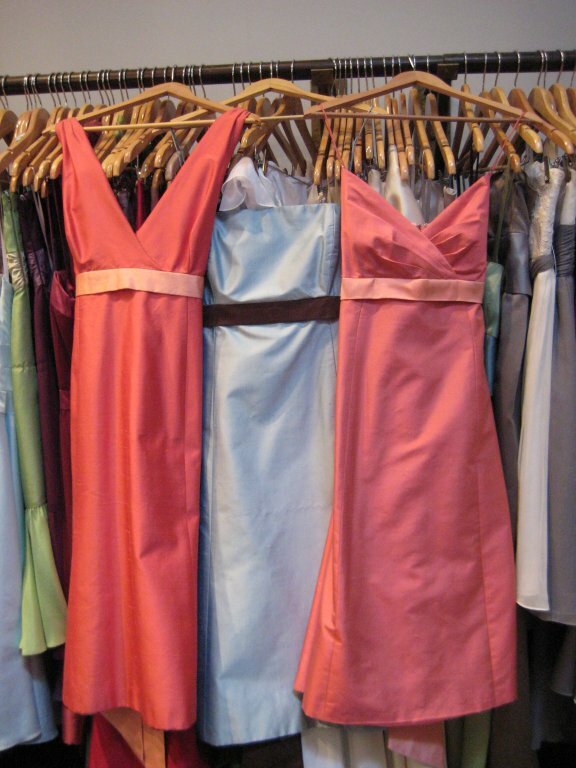 — Ordered bridesmaids dresses from Jenny Yoo. 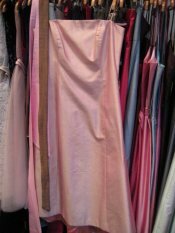 They’re a lovely pink color in silk shantung fabric. My Maid of Honor and I narrowed the choices down to 3 styles and each girl chose their own dress. See how pretty! 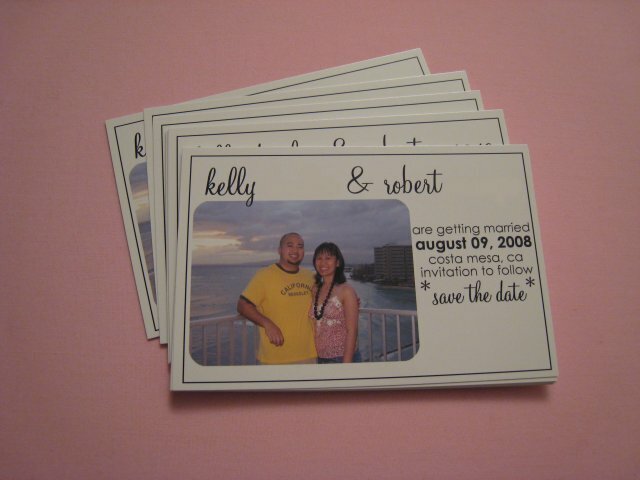 — Ordered and mailed out our Save the Date postcards! In non-wedding news, I totally failed at my Lenten sacrifice this weekend because I ate ice cream both days. OOPS. It was totally worth it, though. :/ Just LOOK! Yesterday, Rob, Diesel and I went to 4th Street in Berkeley. I wanted to go over to my little slice of heaven, aka Paper Source, to get some inspiration for miscellaneous paper projects I have planned for the wedding. Weelll, no trip to 4th Street is complete without a stop at Sketch. The owners, Ruthie and Eric, were former pastry chefs at Aqua. They use produce/fruits that are in season so everything is packed with flavor but never too heavy or too rich. It’s just perfect. 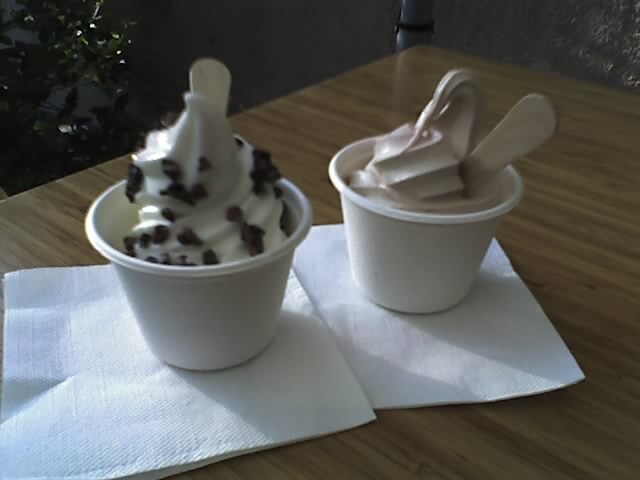 I had the Strauss plain yogurt with cocoa nib topping (on the left) and Rob had the Cocoa Nib. Mmmm. I’m drooling right now thinking about it. We’ve also tried Earl Grey (sounds weird but it’s incredible), Raspberry sorbet (a bit tart but yummy), and Burnt Caramel (*drool*). 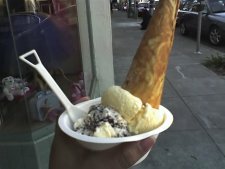 Today’s stop on the East Bay ice cream tour was Ici, also in Berkeley. This store was opened by Mary, a former pastry chef from Chez Panisse… I think I like this trend of pastry chefs leaving top restaurants if it means MORE ICE CREAM STORES! 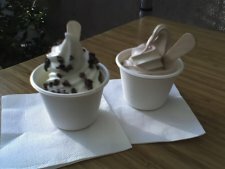 Rob and I waited a little over half an hour to get our ice cream but boy, was it WORTH IT. YUM-O. My treat (pictured above) was the Meyer Lemon (so light, so refreshing) and Chocolate Chip with a hand-rolled cone (the cone was so good and it had a chocolate tip!). Rob had the Chocolate Chip and Milk Chocolate Almond, which was also pretty spectacular. I can’t wait to go back and try some of the other flavors, like Ginger, Honey Lemon, Coconut Sorbet, etc. Diet? What diet? Heh. OOPS.